Many of the recipes that I enjoyed in my childhood and youth now fall under the category of “retro recipes”. Recently I was struck by the contradictory and changing relationship that Canadians have with food and cooking. “Easy Does It”, an article by Corey Mintz in the Globe and Mail argues that we tell ourselves we are too busy to cook but mostly we don’t know how. This makes us vulnerable to cook books and appliances that promise to make it easy. For example we can think of the microwave oven, the slow cooker, the pressure cooker and its current version in the instant pot, and the latest “Sheet Pan Magic” cook book that Mintz describes. Mintz quotes several experts, one of whom claims our desire for easy quick food preparation began in the 1980s when more women were working fulltime out of the home. I’d like to argue it began in the 1950s when canned and frozen foods were promoted as time saving solutions. This article highlighted my puzzlement about the recipe for Pineapple-Coconut Upside-Down Cake in a previous Saturday Globe & Mail. If we are indeed seeking simple and quick then no one will make this recipe because it is totally intimidating! Sixteen ingredients including some that one is likely never to use again – agave syrup, vanilla bean, kosher salt! And, a method almost 500 words long! Out of curiosity I might actually try this recipe but it would indeed be the performance or “self-contained achievement” that Fryer refers to rather than the regular go-to family recipe. So where are we in our relationship to food? We long for quick solutions and at the same time engage in lengthy complex performances. Here is where retro cooking may have a place. 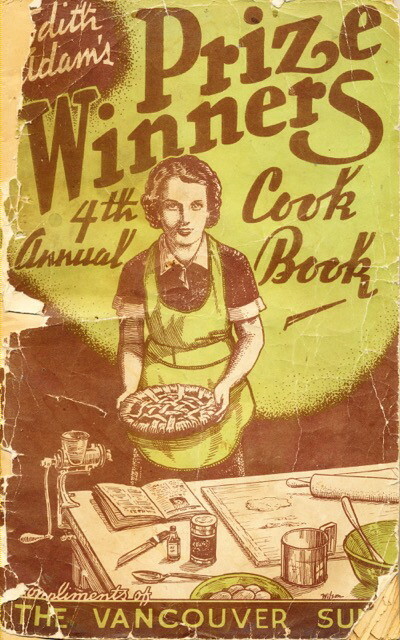 In Edith Adam’s 4th Annual Prize Winners Cook Book (circa 1937), a recipe for “Pineapple Turnover” (really Pineapple Upside Down Cake) appears. 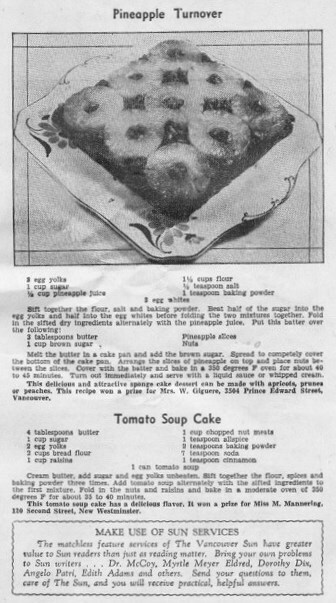 The recipe has 11 ingredients, uses nothing exotic other than canned pineapple and has a method conveyed in 110 words! This makes it a little more inviting and less likely to scare off inexperienced cooks. This contradiction is puzzling to me but worth pondering. Do we want easy recipes or do we want long complex recipes so that when we make them, we can feel like “top chef”! What do you think? I totally agree with you Linda. Make it easy. It is annoying to buy an exotic ingredient the I may never use again or use part of something fresh and end up throwing out most of it. If I look at a recipe and it has more than about 10 items, I move on. It was the 50’s for sure when the convenience craze started. I am looking for information about food that grows here in British Columbia because I suspect that imported food is going to become expensive and less available. I want to pare down my pantry and baking supplies to essentials and not replace the Asian sauces, Mexican peppers, Indian spices and rarely used condiments. So here I am on your site, which is excellent, searching for recipes, storage ideas, preservation hints and tools tips. Pineapple Upside Down cake was a special treat when I was young. I remember broiled icing on top of vanilla cake, too. My father was a hunter so we ate moose, duck and grouse. Never did like moose unless it was ground up, too tough. We lived in the Cariboo in a sawmill camp, and we had wild strawberry jam, pickled crab apples, frozen peaches and home canned fruit. I don’t want to back to the old days of mashed potatoes, canned peas and tough meat but would like to start collecting recipes that are healthy and are based on food that grows well and in abundance here in British Columbia.